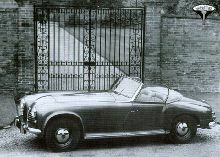 Marauder was set-up by Rover executives George Mackie, Peter Wilks and Spen King to build a sports model based on the successful, but staid Rover P4. Despite a clever design, reasonable looks and good build quality the company struggled to sell the Marauder to its intended audience, due mainly to rising costs for the P4 parts. Only 15 cars were produced between 1950 and 1952. Spen King remained at Rover and went on to design timeless classics such as the Range Rover.